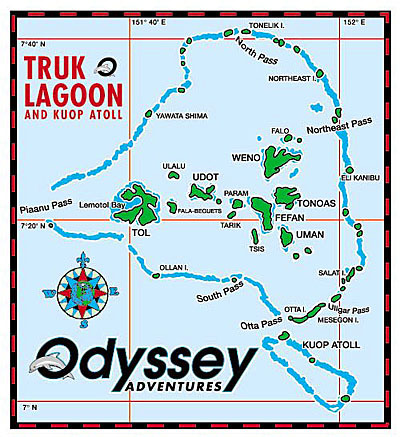 Odyssey Adventures -- Dive with Odyssey Adventures to see the ghost fleet of Truk Lagoon, the world's best shipwreck diving destination. In addition to a great variety of wrecks, you will see an abundance of tropical fish, anemones, gorgonians and eagle rays. The Odyssey, a 132' air-conditioned live-aboard vessel has spacious rooms, private ensuite facilities, and a large entertainment lounge. All meals and beverages are included and so is the nitrox. Accommodating only 16 guests per cruise, you'll experience the best diving of historic Truk Lagoon. On this Island Dreams conducted group tour, you will also enjoy the services of international travel guide and divemaster Ken Knezick. Aboard Ship -- On board the Odyssey, Truk's finest liveaboard vessel, you'll find amenities consistent with the world's top liveaboards. There is carpeting and air-conditioning throughout the vessel. You will enjoy a large dining area with full commercial galley, and a separate entertainment lounge with TV, VCR (PAL & NTSC), DVD, stereo, library and bar. All staterooms have private ensuite facilities, air-conditioning controls, and DVD player. Pricing includes Nitrox fills for Nitrox-certified divers. Divers must pay a $50 per person park fee to dive in Truk Lagoon. All rates are per person on a twin-share basis in US dollars and subject to change without prior notice. Please note: Airfare to Chuuk International Airport is not included in this pricing. The airport code is: TKK. AIR TRAVEL to TRUK, Updated: The Odyssey now operates on a Saturday to Saturday schedule. United Airlines is the primary carrier offering service from the States to Truk ~ their current schedule arrives Truk at 935 PM Saturday evenings on a flight from Guam. The Odyssey crew will meet that flight and transfer guests to the boat. If you have more time, you might think about arriving Truk a day or two in advance to rest and let your body adjust to the time change after travel. Island Dreams will be happy to assist with reservations at the Blue Lagoon Hotel. The Odyssey will pickup guests up at the hotel Saturday afternoon at 5 PM for transfer to the boat. Passengers disembark on Saturday morning at 8:00 AM, but the first available departing United flight is not until Sunday morning at 250 AM. Island Dreams will make reservations for our travelers at the Blue Lagoon Hotel until flight time, which is at additional expense. The Odyssey crew provides transfers to the hotel, and later from the hotel to the airport for the 2:50 AM flight. ** There may also be a Saturday afternoon flight option, but in that case, guests would miss out on Friday's diving. Please contact Island Dreams if you would like assistance in booking your airline ticket. Airline schedules are available for viewing approximately 11 months in advance of travel dates. Susan can research flights for you about mid-august 2018.